Hammonds Band, previously YBS and Yorkshire Building Society Band has been one of the most successful of all contesting brass bands in the last twenty years. It has also been amongst the most innovative with its highly acclaimed CDs and its concert projects, created through close collaboration between band, conductor and composer. Yorkshire Building Society Band grew out of the former Hammonds Sauce Works Band when, in 1993, this band’s 33-year sponsorship ended. There were, at the time, three Hammonds bands and the Building Society, whose headquarters were quite close to the location of the sauce works, agreed to sponsor them all. With slight name changes there were now, in addition to the main band, YBS Hawley Band and YBS Juniors. The name Hawley referred to the former managing director of Hammonds . The first conductor of Yorkshire Building Society Band was Geoffrey Whitham, who had been associated with Hammonds Sauce Works Band for almost 30 years. He was succeeded by the young Australian conductor, David King, in 1993 and then Morgan Griffiths in 2007. Hammonds has an impressive pedigree, with an unbroken sequence of 73 years under various names, and roots going back 150 years to when, in 1855, a brass band was formed as one of the amenities for the people of Saltaire. This was one of the famous ‘model villages’ built during the first half of the 19th century by wealthy industrialists and was the brainchild of Sir Titus Salt, a philanthropic mill-owner and one-time Mayor of Bradford. Salts Mill in Saltaire. Photo used under Wikimedia Commons License. Sir Titus had accumulated vast wealth with which he decided to build a new mill in a self-contained village. He purchased land three miles from Bradford , near to the Bradford-Skipton railway line and adjacent to the River Aire. Building was started in 1851. The village’s name, ‘Saltaire’, combined the names of the river and the owner. It was to be an industrial settlement where people could live close to their work amid such basics as fresh air and pure water - commodities not found in Bradford at the time. The mill opened in 1853. 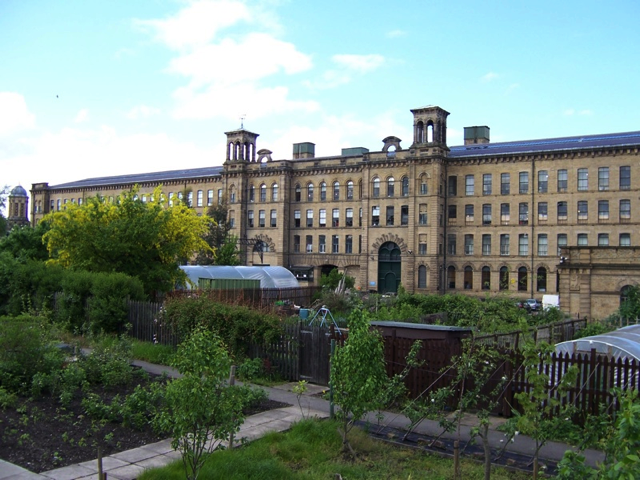 To add to the quality of life in Saltaire there was a library, a gymnasium, a School of Art and a School of Science . There was also a drum and fife band for boys and the brass band for the men of the village. Its first conductor was Joseph Paley whose son, John, became a legendary cornet player, playing with bands as diverse as Black Dyke, situated on the other side of Bradford and Patrick Gilmore’s Band in America. The Saltaire Band was one of the leading brass bands in the early 1860s. Following a contest held at Crystal Palace (London) in 1860, at which it gained 2nd prize, a report in the Daily Telegraph stated: The Saltaire Band is composed entirely of men in the employment of Mr Titus Salt, at the establishment near Bradford which is called after his name. It is rumoured that Mr Salt promised a considerable sum of money to his band in the event of their winning the first prize. It was also rumoured that the band was costing Sir Titus £1,000 per year, a considerable sum in those days. The most informative surviving document regarding the band is its entry form for the Crystal Palace contest of 1861, which it did actually win. Amongst the 17 instrumentalists named is the leader, Richard Smith – a famous cornet player, highly successful conductor, and founder of the brass band music publishers R Smith & Co. Virtually all the players were employed in the mill. With the prospect of employment and the band’s running expenses covered by the company, there were definite advantages for those lucky enough to be members of the band. The Crystal Palace painted in 1851 when the Great Exhibition opened. Photo used under Wikimedia Commons License. Following this somewhat exalted start, Saltaire Band achieved little else of note. A number of local contests were attended up to 1869, bringing in a few prizes. The band then appeared in the Belle Vue September contests of 1872, 73 and 74 conducted by the legendary John Gladney, gaining a 2nd prize in 1872 and a 5th in 1874. After this it assumed the status of an ordinary village band, though the mills still owned the instruments. Sadly, Brass Band News issued the following statement in March 1894: Many old contestors will learn with regret that the once famous Saltaire Brass Band is no more, the instruments and all properties having been called in by the Company. So passes away the remains of one of the best bands Yorkshire ever produced. After a gap of some 38 years, a correspondent writing under the pseudonym ‘Tyke’ wrote the following in Brass Band News of March 1932:Salts Silver, under the tuition of Mr H B Hawley, are making remarkable progress. This is a newly-formed band of 24 enthusiastic performers who mean business. Their practice-room is in the Royal Café, Saltaire, kindly provided rent-free by Messrs. Salts of Saltaire. Mr Hawley has gradually built up this combination to his own liking, and is taking them to their first contest at Pudsey on March 25 th. Mr Hawley is a local organist and composer, and will not be satisfied with his band until it sounds like his organ. A prize at Pudsey is their determination. Sad to say, the opposition was too strong and the band failed to win a prize at Pudsey. However, the second phase was now under way. The band became a member of the Harrogate & District Brass Band Association, of which Mr Hawley was an official. It was at one of the Association’s contests, held in Saltaire in May 1934, that the new band achieved its first win. The band played in the first section, which had an entry of 12 bands, so this was quite an achievement for a two-year-old band. The band was now regularly competing in local contests and even participated in the May contest at Belle Vue on occasion. It regularly changed its name, appearing not only as Salts Silver, but also as Saltaire Mills, Saltaire Subscription and Salts (Saltaire). In addition to the contests, the band participated in local functions – carnivals, park concerts and civic occasions. In 1936 it acquired a new set of uniforms for an appearance at the Belle Vue July contest and had made sufficient progress to be offered a broadcast engagement by the BBC in November. Frank Haigh, a noted Bradford cornet player was now playing principal cornet. In 1937 Salts Band provided music for the visit to Shipley of the King and Queen and by now its conductor, ‘H B’, was proving to be something of a composer, with a number of published marches to his name. Several more prizes were picked up and in a period when Britain was facing acute economic problems, with many bands closing down, this new band did remarkably well. As Salts (Saltaire) it ‘soldiered on’ through the difficult war years, regularly losing members to the armed forces. In the latter part of 1940 Mr Hawley engaged Noel Thorpe as professional conductor and his monthly visits took the band to a higher musical level. More contests were won and, through Mr Hawley’s business contacts, lucrative engagements came the band’s way. In 1945 Harry Grace, a successful Bradford brass band conductor succeeded Noel Thorpe. However, H B Hawley’s enthusiasm for Salts was now waning. He had been the motivator and, frankly, its anonymous sponsor since its founding in 1932. Early in 1946 he decided to form a new junior band, which he hoped to build up in connection with the welfare of his business. He was, in fact, the managing director of Hammonds Sauce Company, based in Shipley, of which Saltaire was a part. Herbert Bowdin Hawley had founded the company in 1924. It had traded under a variety of names and had turned out a variety of products. In 1933 the name ‘ Hammonds ’ appeared and, through its Hammonds Chop Sauce, developed into the largest privately owned sauce company in Britain. But back to the junior band. It started with 16 beginners and within about six months Mr Hawley was able to form a band of 22. For a short time the juniors and the older band existed side by side, but without Mr Hawley’s drive, interest at Salts waned and the band completed its last engagement in July 1946. Several of its members joined the new group, which also acquired the old band’s music library and some instruments. The changeover to Hammonds Sauce Works Band was now complete and the third phase of this remarkable band was now up and running. Contesting was commenced in 1947 and from six contests entered, five prizes were won. In 1948 the band won Class ‘B’ in the Belle Vue May contest and a year later picked up 2nd prize in the 3rd section of the ‘Daily Herald’ Area Contest. Following an influx of new players, the band moved into the championship section. The fifties were years of consolidation here, not easy against the cream of Yorkshire’s bands. There was a huge set-back when Mr Hawley died suddenly, on 22nd December 1953 . Fortunately for the band Horace Hawley, who succeeded his father as managing director of the company, was equally enthusiastic about the band. In fact, he was a member himself for a number of years, playing BB flat bass. A new conductor had been appointed during the summer of 1952. He was Gershom Collison, a former Black Dyke soprano player. The band continued to do well in local contests but the closest it came to a breakthrough at the top level was 3rd prize in the 1957 Area Contest. In the 1960s Collison was nearing retirement, and from the beginning of 1966 Geoffrey Whitham became musical director of Hammonds Sauce Works Band. Geoffrey had a brass band pedigree second to none. He had had a distinguished career as the solo euphonium player with Black Dyke, for a number of years was eminently successful as conductor of its Junior Band and for the last three years had been resident conductor of Black Dyke Mills Band itself. The appointment brought almost immediate success, with 4th prize at the 1967 Area contest and 3rd prize a year later. First prize and qualification for the Finals of the National Brass Band Championships at the Royal Albert Hall came in 1969. As if to underline these successes the band was also declared ‘BBC Band of the Year, 1968’. Between 1972 and 1980 Hammonds qualified for the Finals four times and though never quite reaching the top echelons of bands, they earned fourth place there in 1972. By now the band had also earned its place in the line-up of the British Open Championships at Belle Vue and appeared in the prize lists there on a number of occasions. However, impressive as these results are, Hammonds under Geoffrey Whitham acquired an even finer reputation for its concert work – with slick arrangements and an ability to literally bring an audience to its feet, cheering. There were a number of prizes in the Granada Band of the Year Contest – an entertainment contest geared to appearing on TV; there were also several prizes at Brass in Concert, the contest originally sponsored by Rothman’s. These successes culminated in a Brass in Concert win in 1978. Reflecting its successes on the concert platform, Hammonds toured Australia in 1976, performing in Adelaide , Melbourne , Sydney , Newcastle and Brisbane , to great acclaim. They were the first British brass band to tour Australia since the visit by Besses o’ th’ Barn back in 1910. Then, after the 1978 Rothman’s success, the band spent a week in Canada , appearing at the prestigious Canadian National Exhibition in Toronto . A decade or so later the band was on the move again, thanks to the link with the organisers of Brass in Concert. This time the band went to Vilnius , the capital of Lithuania . The people of this country, who were mostly very poor, gave a great welcome to the men from Yorkshire who brought much pleasure into their hum-drum lives. Following a 4th prize at Belle Vue in 1981 the band struck a bad patch, aggravated by the death of its benefactor, Horace Hawley, and changes in the management structure of the company. Geoffrey Whitham remained as musical director until 1984 when he, along with several band members, resigned through differences with the new management. Though several former Hammonds players formed the nucleus of a newly-formed band, Lewington Yamaha, the new directors of the Sauce Works decreed that their junior band, now called the Hawley Band in recognition of the managing director Horace Hawley, should become the Hammonds Sauce Works Band. It now functioned as such, albeit at a lower musical level. Happily it survived, under various conductors, and in 1988 Geoffrey Whitham returned. As if by magic he led the band to victory in the Grand Shield Contest at Belle Vue, which qualified the band for re-entry into the British Open Championships. In its first year back, the band took 2nd prize, narrowly missing what would have been a historic ‘double’ had it won both contests in the same year. This has never been done, even to this day. Hammonds changed hands yet again in the early nineties and, partly due to its uncertain future, the band hit another lean spell, culminating in the termination of the sponsorship. Mercifully, along came Yorkshire Building Society with a new offer. The band had been saved and was now about to enter the fourth phase in its colourful history, enjoying 11 years of generous sponsorship from the Building Society. This allowed it to indulge in unique and exciting projects, to give concerts and produce recordings in which musical considerations were not inhibited by financial ones, and to produce contest-winning performances that were the envy of the whole brass band movement. In return, it upheld the ideals of its sponsor and, blending tradition and innovation, gave them worldwide publicity such as few other organisations could possibly have done, through its artistic and musical excellence. However, all good things must come to an end and with the utmost regret, Yorkshire Building Society ended its association with the band in 2004. Nevertheless, the band is determined to move on, and with an eye on the past is now established as The YBS Band. As was seen earlier, Geoffrey Whitham remained with the newly named Yorkshire Building Society Band as its first musical director but towards the end of the year, having seen the band established with its new sponsors, he handed over to David King. This dynamic young conductor from Australia took the title Principal Conductor and from time to time brought in resident conductors and guest conductors. The British Open Championships, formerly held at Belle Vue but now established in Birmingham’s modern, lush, Symphony Hall, is the oldest brass band contest in the world, being established in 1853. To be in the winning band at these Championships is every young bandsman’s dream in this country. In its short career, Yorkshire Building Society Band won four times – in 1997, 1999, 2001 and 2003 – almost uncannily winning in alternate years. Another contest in which Yorkshire Building Society Band did unusually well was that held in Cambridge each May, formerly called the All England Masters Championships. The band picked off the title here three times – in 1999, 2000 and 2004. But the event which the band has virtually made its own is the European Brass Band Championships, founded in London in 1978 and moving around the European countries which are rich in brass bands. Aided in no small measure by the contributions made by Yorkshire Building Society Band, the ‘European’ has grown in stature as an international musical event. Yorkshire Building Society Band has been at the forefront of the Championships during the past decade, becoming Champion Band of Europe in 1996, 1997, 1999, 2000, 2001, 2002, 2003 and 2004 – eight wins in nine years, a record unequalled in the history of the Championships. During these ‘European’ years, the band has also contributed significantly to the success of the Gala Concerts associated with the event, with innovative and artistic concert programming. Programmes have included the award-winning Cry of the Celts (1997), Windows of the World (2000), Hymn of the Highlands (2002) and Celtic Fusion (2004) – all commissioned by the band and performed as European Gala premieres. Along with these themed projects, new works have also been commissioned, including Apocolypse by Derek Bourgeois and Music of the Spheres by Philip Sparke, a truly ground-breaking work first performed as the own choice in the 2004 European Championships. In the field of commercial recording, the three-volume CD series, Essays for Brass has contributed significantly to the worldwide recognition of Yorkshire Building Society during the past decade. More recently, Bourgeois in Brass (2003) and Music of the Spheres (2004) – the work which gives this album was commissioned by the band for its 2004 Own Choice test piece in the European Championships – have received high praise and critical acclaim. In both 2002 and 2003 the Yorkshire Building Society Band received ‘Brass Band World’ magazine’s ‘CD of the Year’ awards. Then, in 2003 and 2004, ‘CD of the Year’ and ‘Band of the Year’ titles came its way through the votes cast by readers of the internet brass band site, 4barsrest.com. The latest accolade is the band’s Number One world ranking of contesting bands, determined jointly between British Bandsman and 4barsrest. Such awards reflect recognition of the exceptional flair and versatility of the Yorkshire Building Society Band. As 2008 neared its end several members of the band felt the need for a change of image, which naturally led to talk of a change of name. Since the ending of the sponsorship with Yorkshire Building Society in December 2004 the band had kept their old sponsor's initials as their name (YBS). Although a sensible choice at the time there was a growing mood in the band to look back into their history for a new way forward. From January 2009 the band became the Hammonds Saltaire Band. Looking back through their history it became clear that before the sponsorship from building society the band had two clear periods in its history; the association with Hammonds Sauce Works and their initial origins with the construction of Saltaire by Sir Titus Salt in the early 1850s. Looking through old pictures of the band from their Hammonds Sauce Works days a colour scheme of red, black and gold was chosen (to reflect the colours used on the old officers mess jacket stage uniforms worn by the band). The band decided to keep the black waistcoats (first used towards the end of the Yorkshire Building Society days) and replace the green shirts with red ones. The new logo would use all three of the Hammonds colours. This left the new name for the band, something which evolved over time. Reading earlier sections of the band's history reveals a link with the village of Saltaire from their earliest days. As Salts Silver (and later Saltaire Mills, Saltaire Subscription and Salts (Saltaire) they were conducted by H. B. Hawley who was also the managing director of Hammonds Sauce Works. Over time various names were suggested but after much discussion the majority of the band settled on using both the names of Hammonds and Saltaire. It was felt that the two names best reflected the the largest parts of the band's past over the previous 150 years. So from the 24th January 2009 at their first concert of the year at the Stephen Joseph Theatre in Scarborough the band took to the stage for the first time as the Hammonds Saltaire Band.